A long time coming is just gonna take a little bit longer… in the mean time we get the final compilation to get you caught up on all things Kingdom Hearts before the third and presumably final installment closes out the circle of Square Enix and their Disney crossover. Though there have been only two main iterations on console, the Kingdom Hearts series has expanded on their fairy tale mythos heavily via handhelds, the first two Kingdom Hearts remaster sets featured the first and second game in glorious HD… but with Kingdom Hearts 2.8 Final Chapter Prologue we inch that much closer to Sora and company’s final battle to save the light and lock away the darkness. Unlike the first two remasters, which features wholly previously released titles in one iteration or another, this final set features mostly new content with only Kingdom Hearts Dream Drop Distance (originally released on the 3DS) as the HD remaster. Let’s touch on each experience and build our review around that… fitting because I never did play Dream Drop Distance when it was originally released. 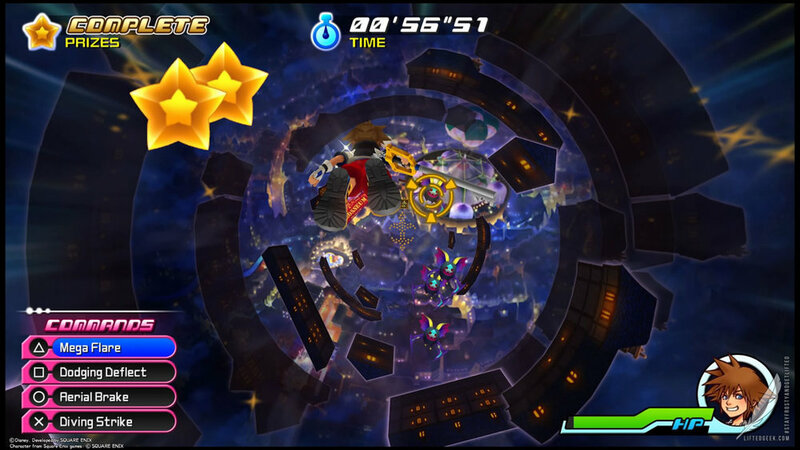 Kingdom Hearts Dream Drop Distance: This game helps to bridge the gap between KHII & KHIII following an all new adventure featuring Sora and Riku. Anticipating Master Xehanort’s eventual return and the oncoming storm he brings, Master Yen Sid decides to train both Sora and Riku to be certified Keyblade Masters… this is by means of the Mark of Mastery exam. 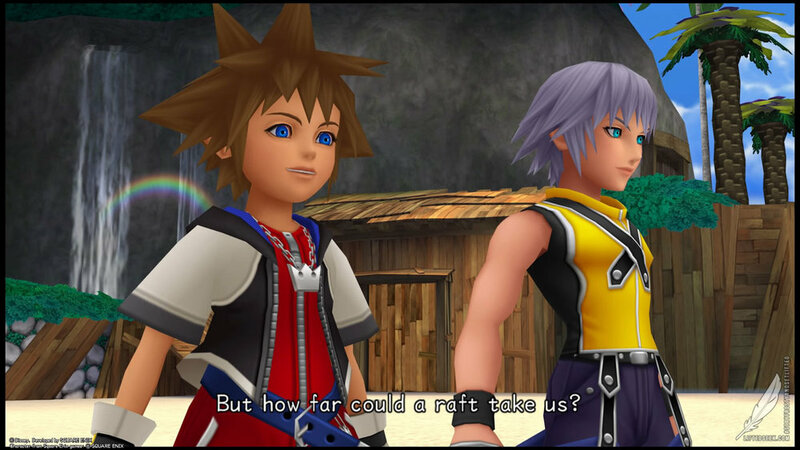 When worlds that were restored after the end of the first Kingdom Hearts end up in a dream-like “sleeping” state, being again threatened by a new evil, both Sora and Riku are tasked to “awaken” these worlds by hunting down the Keyhole of Sleep in each world. Because of the nature of the worlds, both boys are separated at the start of the game. 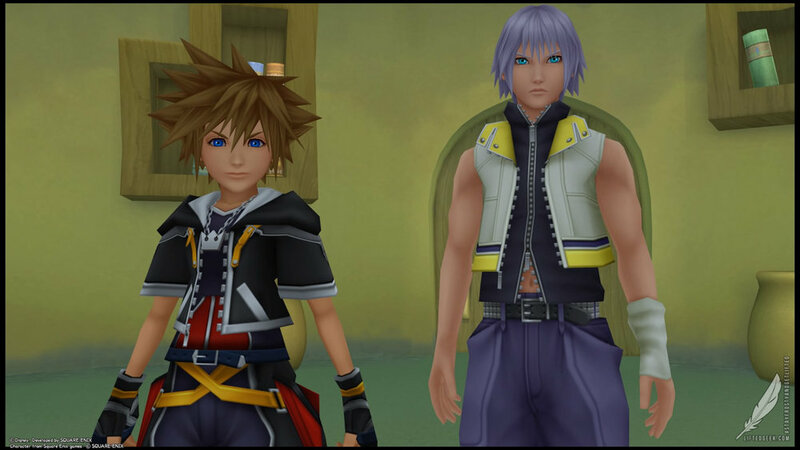 Each world has two versions of itself with Sora and Riku independently tracking down the keyholes. While Dream Drop Distance is presented as one overarching adventure, the game actually ends up playing out like two separate stories bound by the core narrative. Faced with a new enemy, Dream Eaters invade these sleeping worlds. The antagonistic Dream Eaters are called Nightmares, acting much like the Heartless and Nobodies from previous installments albeit with greater variation in archtype. To help combat them, both boys are given the ability to craft Spirit Dream Eaters… friendly versions of Nightmares that fight alongside them. I immediately felt shades of Pokémon and Shin Megami Tensai, instead of having Donald and Goofy as my AI allies, these Spirits act similar with a wide variety of abilities and attacks that can change the outcome of a battle. Combat feels like “Kingdom Hearts light” in many respects, in fact it borrows heavily from Kingdom Hearts Birth by Sleep, opting to bring back the “Command Deck” system that allowed various actions to be cycled throguh. You can customize your command deck with abilities from using a Potion to activating Magic or Offensive Abilities. 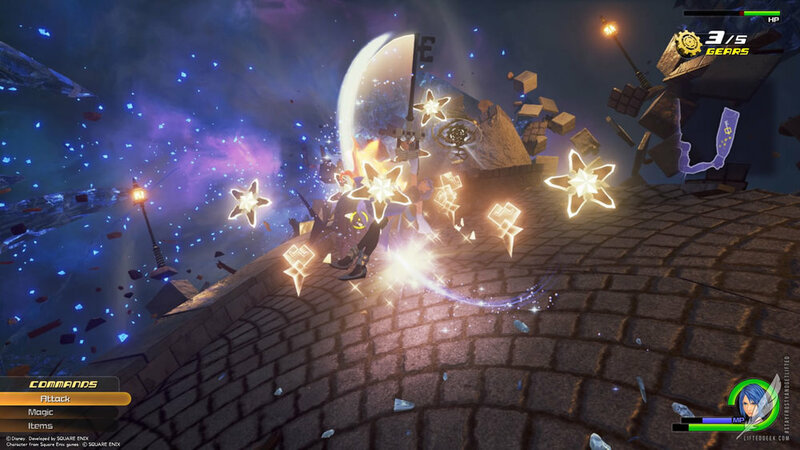 To add a little spice to combat, Flowmotion and Reality Shift give Dream Drop Distance a faster and more frantic pace than Birth by Sleep. Flowmotion allows you to move about the map and attack very fast by committing actions like bouncing off walls or grinding down rails. This element is paramount to survive with much of the game being very challenging, more so than I can even say was in Kingdom Hearts II or Birth by Sleep. Reality Shift varies depending on which world you are in. Where I feel the combat falls short is in the plethora of options feeling a bit too much, it took me a while to get a handle on combat and by the end I still don’t think I was 100% sure I knew what the hell I was doing. The game’s “Drop” system is how we switch back and forth between our heroes. Dropping into a new world puts the game into an on rail combat sequence featuring Sora or Riku literally “dropping” into the new world. These drop sequences feature items, enemies, and even bosses you need to defeat before making it to the next world. Reminds me heavily of the Gummy Ship sequences that separate the worlds. Dropping is entered either manually or automatically depending on your character’s “Drop Gauge.” As you explore the map, your Drop Gauge continually depletes, now this can be filled by defeating enemies or using items, eventually when your Drop Gauge hits zero, the game forces you to switch heroes. This can be a bit frustrating when you are in the middle of a boss battle, if you drop before you defeat the boss… even if said boss is on its last legs… you will switch heroes and even worse when you come back to the boss the fight will start all over again. As I said… there was a bit too much to keep track of. As an entry bridging the gap, it does a good job connecting Kingdom Hearts II to the eventual final installment. I had issues with the combat system but when I eventually found my groove it felt like a much better experience. Visually, there wasn’t much impressive to be honest. Dream Drop Distance looked and felt like a PS2 era game, I get that the 3DS isn’t exactly made to run games like the current gen of gaming consoles, despite the HD coat of paint it plays and looks like a game of a much smaller scale. As for the translation from the handheld format, much of the game’s sequences felt clunky with a controller. While they tried to achieve what they could using the touch pad and controller, the touch elements of the game which they attempted to translate from the 3DS always felt out of place. While a good remaster, Dream Drop Distance was far from perfect. Kingdom Hearts 0.2 Birth by Sleep & χ Back Cover: The last two pieces of this package involve all new content, and while these experiences are dramatically shorter than that in Dream Drop Distance, the value they add feels just as much if not more than the 3DS port. First off, let’s look at the Birth by Sleep spinoff. Following one of the three player characters from Birth by Sleep, Aqua, Kingdom Hearts 0.2 Birth by Sleep A Fragmentary Passage (geez… what a mouthful) was my favorite bit of the whole collection. Built in Unreal Engine 4, this part of the package is like a full on tech demo of what we can expect in Kingdom Hearts III. What with all the spin off titles and games that “almost” replicate the KH formula, this is KH at its core! Playing very similar to the combat from Kingdom Hearts II with improved magic, abilities, and so much more. 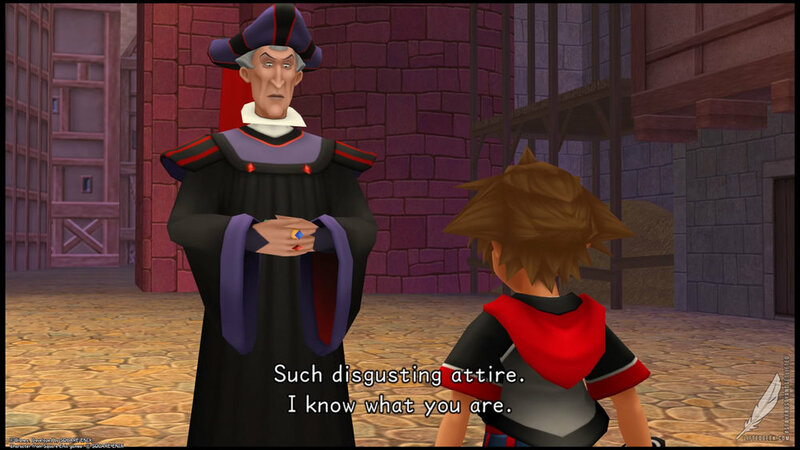 If you weren’t hyped for Kingdom Hearts III yet, then this will be the bit that will ignite that excitement. Story wise, it bridges the gap between Birth by Sleep and the first Kingdom Hearts title. After losing both Terra and Ventus, Aqua is trapped in the Land of Darkness… and empty graveyard of sorts set it a timeless world. Here she faces he own personal demons as well as shades of Master Xehanort. Told from the perspective of Mickey after the events of Dream Drop Distance, Mickey tells the story of how Aqua will fit into the greater Kingdom Hearts universe. Though originally appearing in a spin-off title, it’s exciting to think that for those who have followed this series through all its topsy turvy decisions will get some semblance of a payoff come Kingdom Hearts III. 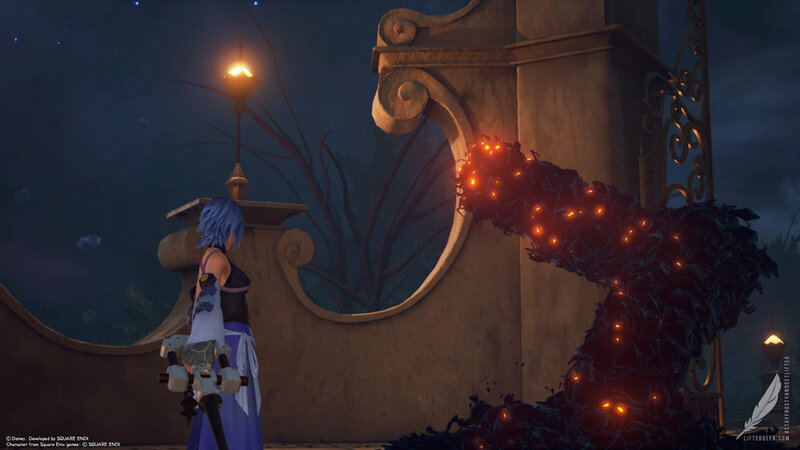 As I said earlier, Aqua’s adventure plays out like a Kingdom Hearts III tech demo of sorts. Combat is very similar to Kingdom Hearts II with dashes of Birth by Sleep sprinkled in. If you played both games, this will feel very familiar to you. Magic is set to a quick menu with commands sitting at the lower left hand side of the screen to attack/use magic/use items. I personally prefer this to the deck based system employed in Birth by Sleep & Dream Drop Distance. Switching forms returns from Birth by Sleep along with Aqua’s Shotlock ability. There is some Flowmotion but not to the degree of Dream Drop Distance. Combat is fluid and much more refined than anything from the previous handheld titles, it feels as perfect as it did in Kingdom Hearts II with additional gameplay elements that didn’t feel clunky like the handhelds. shades of what to expect in KH3! Though it is packaged in as a standalone title, length wise it takes about two hours to beat. This ends up leaving me wanting more and ends up being the biggest negative for me. In the previous ReMix titles, both playable games were full length games so it felt like getting “two games and a movie” for the price of one game… instead this felt like “one and a half games with a special episode.” I’m not complaining too much, I did enjoy the package… I just wish I got more. As for Kingdom Hearts χ Back Cover, much like how in the previous HD remasters they told the story of Kingdom Hearts 358/2 Days & Re:coded, we get an HD cinematic telling an all new story set during the time of the Keyblade War. For those who want to play through the adventure, Kingdom Hearts χ Unchained is available on iOS and Android for free. 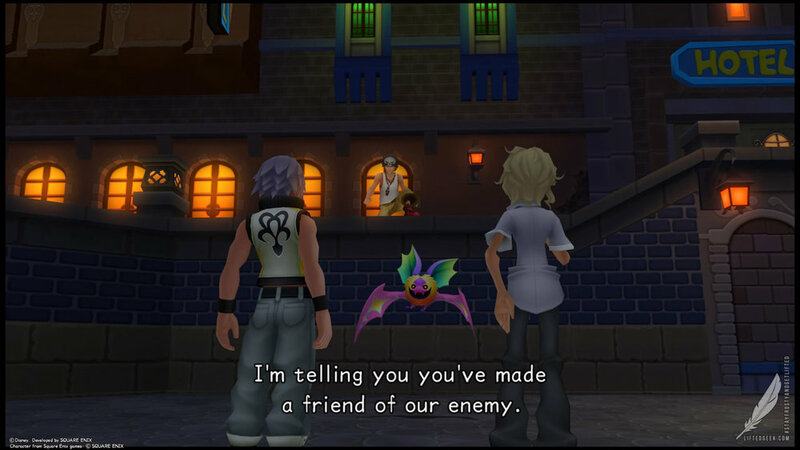 You can get the full story here telling the tale of how five different Keyblade Unions waged a bitter war with each other. Though it does a good job adding more to the package, it felt a bit clunky at time and wasn’t nearly the length of the previous HD Cinematic installments in 1.5 & 2.5 ReMix. I did play the mobile game briefly so it does add much to the experience, but I feel that unless you have at least a passing knowledge of the events this HD cinematic may fall a bit flat for you. As the prologue for Kingdom Hearts III, Kingdom Hearts 2.8 does an excellent job rounding out the story in preparation for the third installment. My one gripe is how short the overall experiences were and I was a bit let down with Dream Drop Distance. As for my biggest plus, Kingdom Hearts 0.2 Birth by Sleep gave me the most enjoyment despite how short it was. I am so pumped to play Kingdom Hearts III and honestly it can’t get here sooner! The last core title was released 11 years ago! As a fan of the series I feel myself and the many who have been clamoring to continue Sora’s adventures have waited long enough.